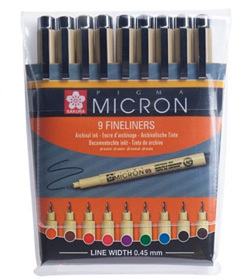 Selection of the most popular 9 colours Pigma Micron 05 pens. The colours included are: Orange, Brown, Red, Rose (Pink), Purple, Green, Blue, Black and Sepia. Acid-free pigment ink pens for water-proof and fade-proof lines, with a 0.45mm line for fine details. Although the pens are considered to be for decorative purposes only on fabrics, meaning do not launder, we have found them to be permanent and washable on silks and cottons - but it is very important to test your fabric first. They are ideal for detailing and signatures, and are very popular with doll artists for faces. Pigma Micron was the very first disposable technical pen ever invented. When accuracy, minute details, and preservation count, the unparalleled archival quality of Pigma Micron pens makes them everyone’s first choice. Artist, writers, and illustrators reach for Pigma Micron and know their work is safeguarded with the permanence of Pigma ink.